Overlaying existing tiles is a common type of renovation done in most houses. Some might think of it as a tedious task, but it is actually quite the contrary especially when done by a trusted and experienced tiling contractor. Overlaying tiles is an innovative way to get your flooring renovated without hacking previously installed tiles. What is Overlaying of tiles? Overlaying tiles is the method of installing new tiles over the existing flooring and is mostly done on vinyl and tile flooring. While overlaying makes the flooring thicker, it is not usually noticeable. Unlike complete hacking of tiles to install new ones, overlaying is definitely more affordable as there is less work required. Overlaying takes lesser times than to hack and relay the tiles. Hacking involves removing the previous flooring, which is not only time-consuming but also costlier. As such, hacking may take up to 3 to 4 days. Make sure to work with reliable tiling contractors in Singapore for overlay tiling works to ensure a more efficient procedure. Overlaying provides a protective layer on the flooring. It acts as a cushion on top of the original tiles, which enhanced the overall durability of your flooring. Overlaying tiles is cheaper and involves lesser work as compared to hacking. You’ll be able to save more with less manpower costs! Remember to check the condition of your old flooring before overlaying your tiles. Most tiling contractors in Singapore may advise not to overlay tiles that are old and hollow. To check if your old tiles are indeed hollow, try tapping it with a coin and look for a hollow sound. Be careful as overlaying new tiles onto old, hollow tiles might lead to it popping out and result in cracking on the new tiles. If this happens, you’ll be required to repair or even redo the entire flooring again. Further tile repairs and tile renovations can be avoided by ensuring that your old tiles are in good condition. If your older tiles were not properly laid and installed, you may face tiling problems like having an uneven surface after overlaying your tiles. Before you proceed with overlaying the tiles, it is important to ensure that the old tiles are evenly laid out. Any gaps in between the tiles or issues with previous grouting might become a potential problem when it comes to overlaying new tiles. Such cases are prominent in HDB flats especially during overlaying of toilet tiles. More porous toilet tiles that are showing signs of moisture may eventually destroy the new flooring. As such, it is important to engage with a professional direct tiling contractor before doing an overlaying job. Overlaying tiles is not an overnight job. Experienced tiling contractors need to take precise measurements in order to correctly trim the size of the new tiles to be installed. By doing so, any uneven gaps in between the tiles are avoided. Doors should also be removed and possibly adjusted so as to accurately suit the thickness of the new tiles. It is important to get your old floor tiles inspected before any overlaying new tiles. Be sure to also consider both the pros and cons of overlaying tiles before delving into the job. 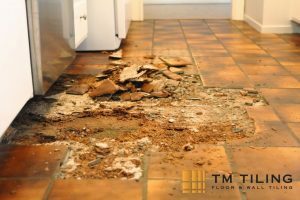 Consider the current condition of your old tiles and seek professional advice from a trusted direct tiling contractor like TM Tiling Singapore. Weigh in the costs involved in the whole process such as the labour and material costs. You may also want to take note of hacking costs and compare it with the total costs involved in overlaying new tiles. However, it is still known that overlaying tiles is a more cost-effective procedure than hacking, which even adds a protective layer to your old flooring. 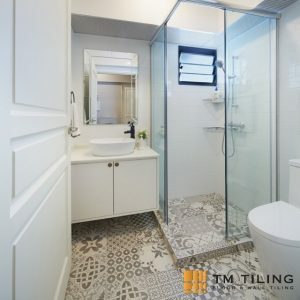 At TM Tiling Singapore, we offer quality tiling services as shown in our past projects. Want to overlay your tiles, but don’t know where to start? We’re here to help. We conduct a thorough inspection before any tiling job and deliver top-notch service from HDB BTO flats to commercial areas. Contact us now to speak with our direct tiling contractors – Call us at +65 6653 5655 or email us at enquiry@tmtiling.com. Our team of tiling experts will get back to you as soon as they can.